Antigone (/ænˈtɪɡəni/ ann-TIG-ə-nee; Ancient Greek: Ἀντιγόνη) is a tragedy by Sophocles written in or before 441 BC. Antigone was written at a time of national fervor. In 441 BC, shortly after the play was performed, Sophocles was appointed as one of the ten generals to lead a military expion against Samos. It is striking that a prominent play in a time of such imperialism contains little political propaganda, no impassioned apostrophe, and, with the exception of the epiklerate (the right of the daughter to continue her dead father's lineage), and arguments against anarchy, makes no contemporary allusion or passing reference to Athens. Rather than become sidetracked with the issues of the time, Antigone remains focused on the characters and themes within the play. It does, however, expose the dangers of the absolute ruler, or tyrant, in the person of Creon, a king to whom few will speak freely and openly their true opinions, and who therefore makes the grievous error of condemning Antigone, an act which he pitifully regrets in the play's final lines. Athenians, proud of their democratic tradition, would have identified his error in the many lines of dialogue which emphasize that the people of Thebes believe he is wrong, but have no voice to tell him so. Athenians would identify the folly of tyranny. The Chorus in Antigone departs significantly from the chorus in Aeschylus' Seven Against Thebes, the play of which Antigone is a continuation. The chorus in Seven Against Thebes is largely supportive of Antigone's decision to bury her brother. Here, the chorus is composed of old men who are largely unwilling to see civil disobedience in a positive light. The chorus also represents a typical difference in Sophocles' plays from those of both Aeschylus and Euripides. A chorus of Aeschylus' almost always continues or intensifies the moral nature of the play, while one of Euripides' frequently strays far from the main moral theme. The chorus in Antigone lies somewhere in between; it remains within the general moral and the immediate scene, but allows itself to be carried away from the occasion or the initial reason for speaking. In this play Sophocles raises a number of questions: Should Polyneices, who committed a serious crime that threatened the city, be given burial rituals, or should his body be left unburied as prey for scavenging animals? Should someone who attempts to bury him in defiance of Creon be punished in an especially cruel and horrible way? Are Creon’s actions justified? Are Antigone’s actions justified? In this play, Creon is not presented as a monster, but as a leader who is doing what he considers right and justified by the state. The chorus is presented as a group of citizens who, though they may feel uneasy about the treatment of the corpse, respect Creon and what he is doing. The chorus is sympathetic to Antigone only when she is led off to her death. But when the chorus learns that the Gods are offended by what Creon has done, and that Creon’s actions will result in the destruction of their city, then they ask Creon to change course. The city is of primary importance to the chorus. Once the initial premises behind the characters in Antigone have been established, the action of the play moves steadily and inevitably towards the outcome. Once Creon has discovered that Antigone buried her brother against his orders, the ensuing discussion of her fate is devoid of arguments for mercy because of youth or sisterly love from the Chorus, Haemon or Antigone herself. Most of the arguments to save her center on a debate over which course adheres best to strict justice. Both Antigone and Creon claim divine sanction for their actions; but Tiresias the prophet supports Antigone's claim that the gods demand Polyneices' burial. It is not until the interview with Tiresias that Creon transgresses and is guilty of sin. He had no divine intimation that his edict would be displeasing to the Gods and against their will. He is here warned that it is, but he defends it and insults the prophet of the Gods. This is his sin, and it is this which leads to his punishment. The terrible calamities that overtake Creon are not the result of his exalting the law of the state over the unwritten and divine law which Antigone vindicates, but are his intemperance which led him to disregard the warnings of Tiresias until it was too late. This is emphasized by the Chorus in the lines that conclude the play. The German poet Friedrich Hölderlin, whose translation had a strong impact on the philosopher Martin Heidegger, brings out a more subtle reading of the play: he focuses on Antigone's legal and political status within the palace, her privilege to be the hearth (according to the legal instrument of the epiklerate) and thus protected by Zeus. According to the legal practice of classical Athens, Creon is obliged to marry his closest relative (Haemon) to the late king's daughter in an inverted marriage rite, which would oblige Haemon to produce a son and heir for his dead father in law. Creon would be deprived of grandchildren and heirs to his lineage – a fact which provides a strong realistic motive for his hatred against Antigone. This modern perspective has remained submerged for a long time. Martin Heidegger, in his essay, The Ode on Man in Sophocles’ Antigone, focusses on the chorus’ sequence of stophe and antistrophe that begins on line 278. His interpretation is in three phases: first to consider the essential meaning of the verse, and then to move through the sequence with that understanding, and finally to discern what was nature of humankind that Sophocles was expressing in this poem. In the first two lines of the first strophe, in the translation Heidegger used, the chorus says that there are many strange things on earth, but there is nothing stranger than man. Beginnings are important to Heidegger, and he considered those two lines to describe primary trait of the essence of humanity within which all other aspects must find their essence. Those two lines are so fundamental that the rest of the verse is spent catching up with them. The authentic Greek definition of humankind is the one who is strangest of all. Heidegger’s interpretation of the text describes humankind in one word that captures the extremes — deinotaton. Man is deinon in the sense that he is the terrible, violent one, and also in the sense that he uses violence against the overpowering. Man is twice deinon. In a series of lectures in 1942, Hölderlin’s Hymn, The Ister, Heidegger goes further in interpreting this play, and considers that Antigone takes on the destiny she has been given, but does not follow a path that is opposed to that of the humankind described in the choral ode. When Antigone opposes Creon, her suffering the uncanny, is her supreme action. An important issue still debated regarding Sophocles' Antigone is the problem of the second burial. 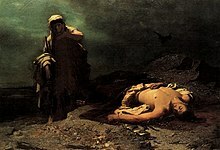 When she poured dust over her brother's body, Antigone completed the burial rituals and thus fulfilled her duty to him. Having been properly buried, Polyneices' soul could proceed to the underworld whether or not the dust was removed from his body. However, Antigone went back after his body was uncovered and performed the ritual again, an act that seems to be completely unmotivated by anything other than a plot necessity so that she could be caught in the act of disobedience, leaving no doubt of her guilt. More than one commentator has suggested that it was the gods, not Antigone, who performed the first burial, citing both the guard's description of the scene and the chorus's observation. Richard Jebb suggests that the only reason for Antigone's return to the burial site is that the first time she forgot the Choaí (libations), and "perhaps the rite was considered completed only if the Choaí were poured while the dust still covered the corpse." Gilbert Norwood explains Antigone's performance of the second burial in terms of her stubbornness. His argument says that had Antigone not been so obsessed with the idea of keeping her brother covered, none of the deaths of the play would have happened. This argument states that if nothing had happened, nothing would have happened, and doesn't take much of a stand in explaining why Antigone returned for the second burial when the first would have fulfilled her religious obligation, regardless of how stubborn she was. This leaves that she acted only in passionate defiance of Creon and respect to her brother's earthly vessel. Tycho von Wilamowitz-Moellendorff justifies the need for the second burial by comparing Sophocles' Antigone to a theoretical version where Antigone is apprehended during the first burial. In this situation, news of the illegal burial and Antigone's arrest would arrive at the same time and there would be no period of time in which Antigone's defiance and victory could be appreciated. J. L. Rose maintains that the solution to the problem of the second burial is solved by close examination of Antigone as a tragic character. Being a tragic character, she is completely obsessed by one idea, and for her this is giving her brother his due respect in death and demonstrating her love for him and for what is right. When she sees her brother's body uncovered, therefore, she is overcome by emotion and acts impulsively to cover him again, with no regards to the necessity of the action or its consequences for her safety. Bonnie Honig uses the problem of the second burial as the basis for her claim that Ismene performs the first burial, and that her pseudo-confession before Creon is actually an honest admission of guilt. A well established theme in Antigone is the right of the individual to reject society's infringement on her freedom to perform a personal obligation. Antigone comments to Ismene, regarding Creon's edict, that "He has no right to keep me from my own." Related to this theme is the question of whether Antigone's will to bury her brother is based on rational thought or instinct, a debate whose contributors include Goethe. The contrasting views of Creon and Antigone with regard to laws higher than those of state inform their different conclusions about civil disobedience. Creon demands obedience to the law above all else, right or wrong. He says that "there is nothing worse than disobedience to authority" (An. 671). Antigone responds with the idea that state law is not absolute, and that it can be broken in civil disobedience in extreme cases, such as honoring the gods, whose rule and authority outweigh Creon's. In Antigone, Sophocles asks the question, which law is greater: the gods' or man's. Sophocles votes for the law of the gods. He does this in order to save Athens from the moral destruction which seems imminent. Sophocles wants to warn his countrymen about hubris, or arrogance, because he believes this will be their downfall. In Antigone, the hubris of Creon is on display. Creon's decree to leave Polyneices unburied in itself makes a bold statement about what it means to be a citizen, and what constitutes abdication of citizenship. It was the firmly kept custom of the Greeks that each city was responsible for the burial of its citizens. Herodotus discussed how members of each city would collect their own dead after a large battle to bury them. In Antigone, it is therefore natural that the people of Thebes did not bury the Argives, but very striking that Creon prohibited the burial of Polyneices. Since he is a citizen of Thebes, it would have been natural for the Thebans to bury him. Creon is telling his people that Polyneices has distanced himself from them, and that they are prohibited from treating him as a fellow-citizen and burying him as is the custom for citizens. Antigone's determination to bury Polyneices arises from a desire to bring honor to her family, and to honor the higher law of the gods. She repeatedly declares that she must act to please "those that are dead" (An. 77), because they hold more weight than any ruler, that is the weight of divine law. In the opening scene, she makes an emotional appeal to her sister Ismene saying that they must protect their brother out of sisterly love, even if he did betray their state. Antigone believes that there are rights that are inalienable because they come from the highest authority, or authority itself, that is the divine law. While he rejects Antigone's actions based on family honor, Creon appears to value family himself. When talking to Haemon, Creon demands of him not only obedience as a citizen, but also as a son. Creon says "everything else shall be second to your father's decision" ("An." 640–641). His emphasis on being Haemon's father rather than his king may seem odd, especially in light of the fact that Creon elsewhere advocates obedience to the state above all else. It is not clear how he would personally handle these two values in conflict, but it is a moot point in the play, for, as absolute ruler of Thebes, Creon is the state, and the state is Creon. It is clear how he feels about these two values in conflict when encountered in another person, Antigone: loyalty to the state comes before family fealty, and he sentences her to death. In Antigone as well as the other Theban Plays, there are very few references to the gods. Hades is the god who is most commonly referred to, but he is referred to more as a personification of Death. Zeus is referenced a total of 13 times by name in the entire play, and Apollo is referenced only as a personification of prophecy. This lack of mention portrays the tragic events that occur as the result of human error, and not divine intervention. The gods are portrayed as chthonic, as near the beginning there is a reference to "Justice who dwells with the gods beneath the earth." Sophocles references Olympus twice in Antigone. This contrasts with the other Athenian tragedians, who reference Olympus often. Antigone's love for family is shown when she buries her brother, Polyneices. Haemon was deeply in love with his cousin and fiancée Antigone, and he killed himself in grief when he found out that his beloved Antigone had hanged herself. Felix Mendelssohn composed a suite of incidental music for Ludwig Tieck's staging of the play in 1841. It includes an overture and seven choruses. Walter Hasenclever wrote an adaptation in 1917, inspired by the events of World War I.
French playwright Jean Anouilh's tragedy Antigone was inspired by both Sophocles' play and the myth itself. Anouilh's play premièred in Paris at the Théâtre de l'Atelier in February 1944, during the Nazi occupation of France. Right after World War II, Bertolt Brecht composed an adaptation, Antigone, which was based on a translation by Friedrich Hölderlin and was published under the title Antigonemodell 1948. The Haitian writer and playwright Félix Morisseau-Leroy translated and adapted Antigone into Haitian Creole under the title, Antigòn (1953). Antigòn is noteworthy in its attempts to insert the lived religious experience of many Haitians into the content of the play through the introduction of several Loa from the pantheon of Haitian Vodou as voiced entities throughout the performance. Antigone inspired the 1967 Spanish-language novel La tumba de Antígona (English title: Antigone's Tomb) by María Zambrano. Puerto Rican playwright Luis Rafael Sánchez's 1968 play La Pasión según Antígona Pérez sets Sophocles' play in a contemporary world where Creon is the dictator of a fictional Latin American nation, and Antígona and her 'brothers' are dissident freedom fighters. In 1977, Antigone was translated into Papiamento for an Aruban production by director Burny Every together with Pedro Velásquez and Ramon Todd Dandaré. This translation retains the original iambic verse by Sophocles. In 2004, theatre companies Crossing Jamaica Avenue and The Women's Project in New York City co-produced the Antigone Project written by Tanya Barfield, Karen Hartman, Chiori Miyagawa, Pulitzer Prize winner Lynn Nottage and Caridad Svich, a five-part response to Sophocles' text and to the US Patriot Act. The text was published by NoPassport Press as a single ion in 2009 with introductions by classics scholar Marianne McDonald and playwright Lisa Schlesinger. There are four operas: Antigone (1977) by Dinos Constantinides, on an English libretto by Fitts and Fitzgerald, Antigone (1986) by Marjorie S. Merryman, Antigone (1988) with music by Vassily Lobanov and libretto (in Russian) by Alexey Parin and the fourth – The Burial at Thebes (2007–2008) by Dominique Le Gendre and libretto by Seamus Heaney, based on his translation for the normal spoken theatre. The production features conductor William Lumpkin, stage director Jim Petosa, and six singers and ten instrumentalists. Bangladeshi director Tanvir Mokammel in his 2008 film Rabeya (The Sister) also draws inspiration from Antigone to parallel the story to the martyrs of the 1971 Bangladeshi Liberation War who were denied a proper burial. In 2000, Peruvian theatre group Yuyachkani and poet José Watanabe adapted the play into a one-actor piece which remains as part of the group's repertoire. An Iranian absurdist adaptation of Antigone was written and directed by Homayoun Ghanizadeh and staged at the City Theatre in Tehran in 2011. Roy Williams’s 2014 adaptation of Antigone for the Pilot Theatre relocates the setting to contemporary street culture. Syrian playwright Mohammad Al-Attar adapted Antigone for a 2014 production at Beirut, performed by Syrian refugee women. "Antigona," a 90-minute flamenco version, performed by Soledad Barrio and Noche Flamenca, with Barrio as Antigona. Martín Santangelo, Artistic Director and Producer, with Choreography by Soledad Barrio and additional choreography by Isabel Bayon; Consulting Director, Lee Breuer; Mask Design based on the work of Mary Frank; Music by Eugenio Iglesias, Salva de Maria and Martín Santangelo. Presented at the West Park Presbyterian Church, 165 West 86th Street, New York, NY 10024, July 13 to August 15, 2015. In 2012, the Royal National Theatre adapted Antigone to modern times. Directed by Polly Findlay, the production transformed the dead Polyneices into a terrorist threat and Antigone into a "dangerous subversive." Japanese drama, Sora kara furu ichi oku no hoshi has the similar theme. In 2017 Kamila Shamsie published Home Fire, which transposés some of the moral and political questions in Antigone into the context of Islam, ISIS and modern-day Britain. Yorgos Tzavellas adapted the play into a 1961 film which he also directed. It featured Irene Papas as Antigone. Liliana Cavani's 1970 I Cannibali is a contemporary political fantasy based upon the Sophocles play, with Britt Ekland as Antigone and Pierre Clémenti as Tiresias. The 1978 omnibus film Germany in Autumn features a segment by Heinrich Böll entitled “The Deferred Antigone” where a fictional production of Antigone is presented to television executives who reject it as ”too topical”. A 2011 Hungarian film version starred Kamilla Fátyol as Antigone, Zoltán Mucsi as Creon and Emil Keres as Tiresias. In 1986, Juliet Stevenson starred as Antigone, with John Shrapnel as Creon and Sir John Gielgud as Tiresias in the BBC's The Theban Plays. Antigone at the Barbican was a 2015 filmed-for-TV version of a production at the Barbican directed by Ivo van Hove; the translation was by Anne Carson and the film starred Juliette Binoche as Antigone and Patrick O'Kane as Kreon. Other TV adaptations of Antigone have starred Irene Worth (1949) and Dorothy Tutin (1959), both broadcast by the BBC. 2006 – A. F. Th. van der Heijden, 'Drijfzand koloniseren' ("Colonizing quicksand"), prose, adapting Antigone's story using characters from the author's 'Homo Duplex' saga. 2011 - Diane Rayor, Sophocles’ Antigone: A New Translation. Cambridge University Press. 2017 – Griff Bludworth, ANTIGONE (born against). A contemporary play adaptation that addresses the theme of racial discrimination. ^ Sophocles (1986). The Three Theban Plays: Antigone, Oedipus the King, Oedipus at Colonus. Translated by Robert Fagles. New York: Penguin. p. 35. ^ Sophocles (1947). Sophocles: The Theban Plays (Penguin Classics). Translated by E.F. Watling. The Penguin Group. ^ a b Bates, Alfred, ed. (1906). The Drama: Its History, Literature and Influence on Civilization, Vol. 1. London: Historical Publishing Company. pp. 112–123. ^ Rosenfield, Kathrin H. (2010). Antigone: Sophocles' Art, Hölderlin's Insight. Translated by Charles B. Duff. Aurora, Colorado: The Davies Group, Publishers. pp. 1–22. ISBN 978-1934542224. ^ Letters, F. J. H. (1953). The Life and Work of Sophocles. London: Sheed and Ward. pp. 147–148. ^ a b Collins, J. Churtin (1906). "The Ethics of Antigone". Sophocles' Antigone. Translated by Robert Whitelaw. Oxford: Clarendon Press. ^ Else, Gerald F. (1976). The Madness of Antigone. Heidelberg: Carl Winter Universitätsverlag. p. 43. ^ Ferguson, John (2013). A Companion to Greek Tragedy. University of Texas Press. p. 173. ISBN 9780292759701. ^ Jebb, Sir Richard C. (1900). "Verse 429". Sophocles: The Plays and Fragments, with critical notes, commentary, and translation in English prose. Part III: The Antigone. Cambridge: Cambridge University Press. ^ a b Rose, J. L. (March 1952). "The Problem of the Second Burial in Sophocles' Antigone". The Classical Journal. 47 (6): 220–221. JSTOR 3293220. ^ Honig, Bonnie (2011). "ISMENE'S FORCED CHOICE: SACRIFICE AND SORORITY IN SOPHOCLES' ANTIGONE" (PDF). Arethusa. The Johns Hopkins University Press. 44: 29–68. ^ a b Levy, Charles S. (1963). "Antigone's Motives: A Suggested Interpretation". Transactions of the American Philological Association. 94: 137–44. doi:10.2307/283641. JSTOR 283641. ^ Sophocles (1991). Sophocles: Oedipus the King, Oedipus at Colonus, Antigone. Translated by David Grene. University of Chicago Publishers. p. Line 48. ISBN 978-0-226-30792-3. ^ a b MacKay, L. (1962). "Antigone, Coriolanus, and Hegel". Transactions and Proceedings of the American Philological Association. 93: 178–179. JSTOR 283759. ^ Medrek, T.J. (November 6, 1999). "BU Opera fest's 'Antigone' is a lesson in excellence". Boston Herald. p. 22. Retrieved March 8, 2010. ^ Grupo Cultural Yuyachkani: Antígona [Yuyachkani Cultural Group: Antigone]. Scalar (in Spanish). 11 March 2011. Retrieved 24 March 2018. ^ "نگاهی به نمایش "آنتیگونه" نوشته و کار "همایون غنی‌زاده"" [Take a look at the "Antigone" display of Homayoun Ghanizadeh]. Irani Art (in Persian). February 1389. Retrieved 24 March 2018. ^ Hickling, Alfred (September 23, 2014). "Antigone Review – engaging Gangland Sophocles". The Guardian. ^ Fordham, Alice (December 13, 2014). "Syrian Women Displaced By War Make Tragedy Of 'Antigone' Their Own". National Public Radio. ^ "Antigone: Cast & creative". National Theatre. The Royal National Theatre. Archived from the original on 31 August 2012. Retrieved 23 July 2018. ^ Billington, Michael (31 May 2012). "Antigone – review". The Guardian. Retrieved 5 December 2015. ^ "The Deferred Antigone (Germany in Autumn, 1978)". YouTube. Retrieved 30 June 2018. ^ Gillespie, Jill. "Deutschland Im Herbst - Film (Movie) Plot and Review". FilmReference. Retrieved 30 June 2018. Butler, Judith (2000). Antigone's Claim: Kinship Between Life and Death. New York: Columbia University Press. ISBN 0-231-11895-3. Heaney, Seamus (December 2004). "The Jayne Lecture: Title Deeds: Translating a Classic" (PDF). Proceedings of the American Philosophical Society. 148 (4): 411–426. Archived from the original (PDF) on 2011-10-18. Heidegger, Martin; Gregory Fried; Richard Polt (2000). An Introduction to Metaphysics. New Haven: Yale University Press. pp. 156–176. ISBN 978-0-300-08328-6. Heidegger, Martin; McNeill, William; Davis, Julia (1996). Hölderlin's Hymn "The Ister". Bloomington: Indiana University Press. Lacan, Jacques (1992). The Seminar of Jacques Lacan, Book VII: The Ethics of Psychoanalysis. Dennis Porter, translator. New York: W.W. Norton. pp. 240–286. ISBN 0-393-31613-0. Miller, Peter (2014). "Helios , vol. 41 no. 2, 2014 © Texas Tech University Press 163 Destabilizing Haemon: Radically Reading Gender and Authority in Sophocles' Antigone". Helios. 41 (2): 163–185. Retrieved 25 January 2017. Segal, Charles (1999). Tragedy and Civilization: An Interpretation of Sophocles. Norman, OK: University of Oklahoma Press. p. 266. ISBN 978-0-8061-3136-8. Steiner, George (1996). Antigones: How the Antigone Legend Has Endured in Western Literature, Art, and Thought. New Haven: Yale University Press. ISBN 0-300-06915-4. Wikimedia Commons has media related to Antigone.